Promo SMS Sender provides solutions to send bulk SMS messages and vCards (via SMS) using the GSM modem or mobile phone. Promo SMS Sender is software for SMS advertising and SMS marketing. Promo SMS Sender supports long and flash SMS, 7-bit, UCS2 (16-bit unicode) character encoding. Support all international characters. Import phone number list from CSV files. 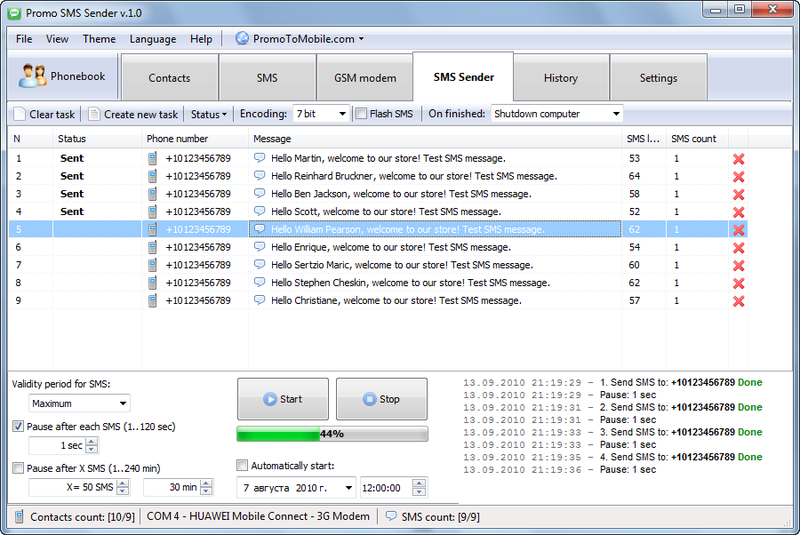 The SMS editor displaying information about the total length of your text message. Qweas is providing links to Promo SMS Sender 1.5 as a courtesy, and makes no representations regarding Promo SMS Sender or any other applications or any information related thereto. Any questions, complaints or claims regarding this application Promo SMS Sender 1.5 must be directed to the appropriate software vendor. You may click the publisher link of Promo SMS Sender on the top of this page to get more details about the vendor.